This is a tutorial I put together a while back and forgot about. Yep, mommy brain. I know, all the cherry blossoms are gone. I love them. This is what I see each spring when I look out the living room window! It's like a big pink cotton candy cloud! They inspired me to make an embellished t-shirt. I got so many compliments on it that I decided to make a tutorial. It's very simple. some other knit fabric (I used an old onesie) for the 'blossoms"
Cut several long strips (1/4 inch wide) of your knit fabric. Start at the back and pin your design. There is no rhyme or reason to it. For all I care you can just throw your strips in the air and pin them where ever they land. Actually, do that. It's much more fun that being precise and you get to throw something! When your done throwing and pinning, sew them on (straight stitch, down the middle). I just started a new strip where the old one left off (if that makes any sense). Now for you "blossoms). These are a simple heart shape (like the JCrew T). You do a simple running stitch down the middle. and then gather it slightly. I made them in three sizes. You will want to make about 20 of them. Then just hand sew them on. Put some in clusters and some on their own. There ya have it. A fun,simple take on all of the embellished t-shirts floating around this spring. Next, you will create your diamond shapes. Cut them out. Cut several in all three of the colors you chose. Next fuse your diamonds on to the t-shirt with your iron according to the package directions. I use Heat n Bond lite a lot for applique. Make sure to buy the light weight Heat n Bond. There is an "Ultra Heat n Bond" but the adhesive is very thick and stiff. It is not meant for sewing on. It says that it will not come off in the wash. I have tried washing it a few times and it has never held through more than two washes. I started with the shoulders. I chose a different shape there because diamonds didn't work in that area. It's a square that comes down from the shoulder seams. I clipped it to curve with the neck band of the T-shirt. The next row looks white in the photo but its a "Heather Grey". I started with the two middle diamonds first and then ended up cutting the two one the ends in half to get them to fit. The third row is white (my third color). All four fit this time. Just keep fusing each row at a time alternating color every row. Notice how I had to trim the points off the bottom? You may have to mess around with them a little to get it right. Who doesn't like good puzzle now and then? The next step is to sew a straight stitch around each diamond. I used a color i felt would blend well with each color of diamonds. I know, brilliant! Break out your ruler and a fabric marker (I used a pencil because it was closer to me than the fabric marker). Draw diagonal lines in one direction through the middle of each diamond. First one direction, then the other. Then, using a nice contrasting thread that goes well with your three colors, sew a straight line over each of the lines you drew. It would look much nicer if it was embroidered. But seriously, who has the time for that? It's for a kid. It's just ganna get trashed anyway! Here is what it will look like when your all finished (and all those stinkin threads are clipped). This makes me miss the 80s. Don't worry, I don't plan on losing my socks and flipping my collar just yet. It sure was fun though! It's been pretty cold in NYC lately. I decided to make a few hats for my girls the other day and they turned out pretty cute. I just may have to make a few of them for myself. I put together a tutorial to share how I made them. 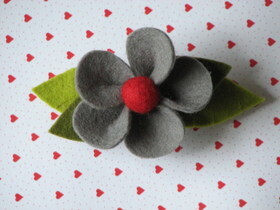 2 colors of 100% wool felt-One for the flower and another for the center. A hat that fits the lucky little girl or boy who will be taking your mad sewing skills for granted. You will be performing "surgery" on this sweater. Make sure that you are not too attached to it! Don't be afraid to "cut". Your a seamstress. That's what we do. We cut. We change lives. We save. To be a good seamstress you have to think like a seamstress. Emotions can be messy. You need to tuck them away and step into a clean sterile studio where the procedure is simple. You cut, you suture, you close. Now let's do this! Take the hat and place it on top of the bottom of the sweater. This is your "pattern". I placed mine a little bit above the ribbing because I wanted it to come down a bit lower on her than the old hat. Take a deep breath. Hold the scissors steady, and make the cut. Now you sew a seam along the outer edge. Now lay your hat flat with the seam going down the middle. Your going to want to sew another seam across the top. (My hand looks a little creepy in that photo). Then, you take another deep breath, hold the scissors steady, and make your final cut across the top. This will give it it's shape. Excellent! THis is what the inside will look like inside out when your done. And now right side out. Now for the felt. This is the shape of the flower petals I chose. They are three inches long and about an inch wide. I cut them with pinking shears. Take some liberty with the shape, size color and make it your own. This is the fun part. Pin your petals to the hat. And sew them on. I did a straight line down the middle of each of them. Now for the flower center. I just cut out a circle and folded it in half. Next, I took the embroidery floss and made a few stitches in the fold. Then, I folded it in half again and made a few stitches. This makes it stand out a little. Then just sew it on the center of the flower. Thats it! I am investing in some good hand lotion tomorrow! Oh the flu! We have have a house full of sickos! When each child has a five day stretch of sickness and you have three children that makes fifteen days of chicken noodle soup, tylenol, doctors visits, sleeping in mom and dads bed, movies, new coloring books. I could go on and on. Now I have a nine month old who won't let anyone hold her but me. Which is very sweet but also a bit exhausting. I managed to create a tutorial for a ruffle scarf I made a while back. It is so easy and the result are very cute. I'm not sure if cute is the right word. I guess dramatic works better. I usually am a little more "understated" with what I wear but I really like this crazy thing. I'm sure I will put it to good use. -One simple scarf in the same color that you choose for your fabric. Any length will work. Mine was about 60 inches long. First, cut several long (about 15) strips of your fabric. I cut mine 2 inches wide. Before you get started you may want to do something to finish the edges of your ruffle strips. The fabric I chose frays like crazy so I zigzagged along each edge. When you come to the end of the fabric make sure that you leave a long "tail". Then you will gently pull the bottom thread to slide the material down the thread toward the other end of the strip. When the fabric has been gathered to your liking just tie a knot in both ends. You can create very tightly gathered ruffles or make them loose depending on the results you want. The next step is to pin your ruffle strip to your scarf in a straight line along the edge of your scarf. Then carefully sew it on stitching down then middle of the ruffle (over your basting stitches). Then you pin your next ruffle on where you left off. Repeat this until you have the entire scarf covered in the ruffles! At least, that's what I did. For a less dramatic look you could just sew one down each side. Or a few across the bottom. Or in a spiral and make a "ruffle rosette" scarf. Oh, the possibilities are endless. So now, go forth and ruffle on, my friend. Ruffle on! This project is so simple. It's a great way to stuff a stocking or embellish a gift wrapped for a little girl. Honestly, I have had several big girls ask for them too! I have not made a tutorial on my blog yet but I decided to give it a go. I know that there are lot's of people getting ready for Holiday gifts. These will take about five minutes and cost you about 35 cents. This entire tutorial was created with my sick nine month old in the front carrier. Half the time she was sleeping. The other half of the time she was pulling my hair or trying to grab the camera. Aside from the craziness, I think I was able to give an explanation as to how I make them. -Something for the flowers "center". I used a felted wool ball this time but I have used rhinestone, beads, etc. First you will need to cut two squares out of your felt a little bigger than your metal clip. Next you will need to cut a tiny hole in the center of the top of one of your squares. I do this by pinching the felt and then snipping a TINY hole into the top. Slip the back of your clip through the hole you just created. Next your will want to put the other piece of felt on top sandwiching your clip in the middle. You will take a long piece of embroidery thread (I usually just use two strands of it) and make a knot at one end. After you are finished sewing around the clip tie a small knot in the back and clip your thread. Then you will want to trim all the extra felt as close to the stitches as you can WITHOUT clipping your thread. Now for the flower pedals! This is the shape I chose for the tutorial. They are about a half of an inch. You will need five pedals for each flower. The next step is to sew them together with a long piece of embroidery thread with a knot at the end of it. Start at the v in the flower pedal. Pull each one down to the knot. This is what you will have when your finished with the flower. Next you take the thread around to the back and sew the first and the last pedal together and tie a knot. Now just glue the felt ball or whatever you chose for your center on and then pop it on the clip and your set.